Just stopping to say I’m still here but feeling under the weather right now. I didn’t realize that in my new vocation you go through an incubation period where whatever viruses that come into the practice you are susceptible to them also. So I’ve been coughing, runny nose, sore throat with laryngitis and body aches. There’s still some creating going on here but it’s just really slow. I’m still searching for the right pattern for the tops to make out of the material I showed in my last post. 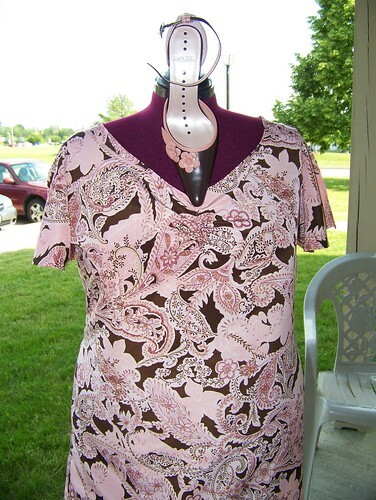 I want something with a scoop neckline and maybe a side tied waistband. It has to be something with an element of interest as the skirts will be plain at least, that’s where I am with the idea right now. My medicine is starting to kick in so I’m getting back in the bed. Progress is making it’s way into my life. I sat in my last final yesturday and it felt wonderful!!!!! It was a challenge to return to school and start a new career after 40 and I’m in a happy place right now. Don’t get me wrong, as you all that are/have done this it’s a big deal but the end result is well worth it. If you read my blog regularly you’ve read how I came to have my job and it was all a blessing. I’ve been thinking of what I can accomplish now that school is over and the first thing I want to complete is the rest of my Christmas knitting and sewing which I will share in the coming weeks. 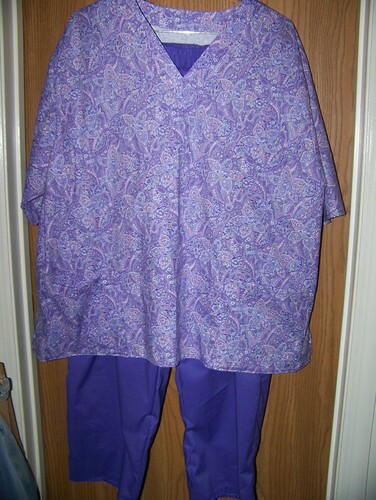 The next thing I’ve been planning is some sewing and my plan is for a few dress casual looks. All of my fabric was purchased at JoAnn Fabrics about a month ago. 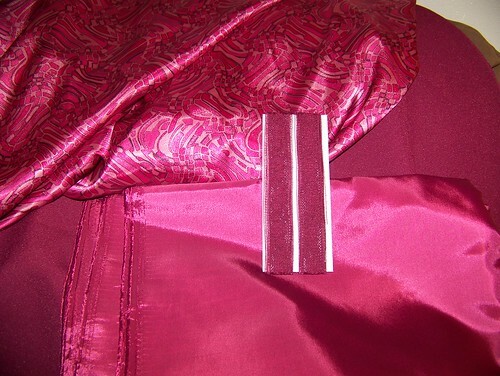 I was drawn to the silky charmuse fabrics that I purchased and then found the suiting fabrics to match for the skirts. 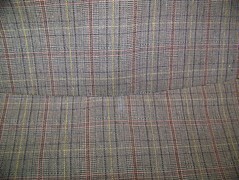 You can see I found the lining and the lace trim. I also wanted to discuss and new podcast that I found and love. It’s Craft Mentality with Amber and Tasha from Baltimore. 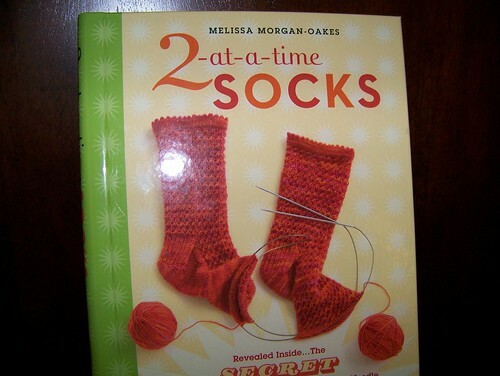 These two ladies are very entertaining and I love how they really cover a variety of crafts. They cover knitting, crochet, quilting, and sewing and to top it off they do a weekly review of one of my favorite shows Project Runway. Hope you’ll take time to give a listen and enjoy. This is all I have for now but be on the lookout I plan to get my mojo running. 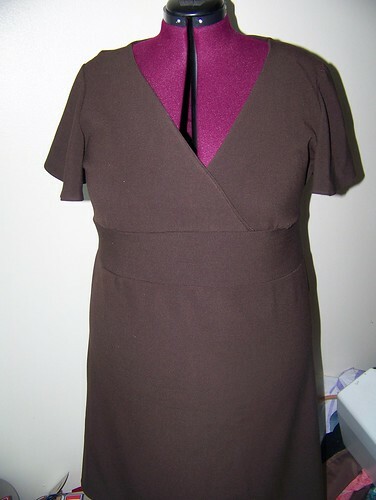 This is my latest dress NewLook 6515 using a shirt pattern and making it into a dress. Yes, this is my second one. 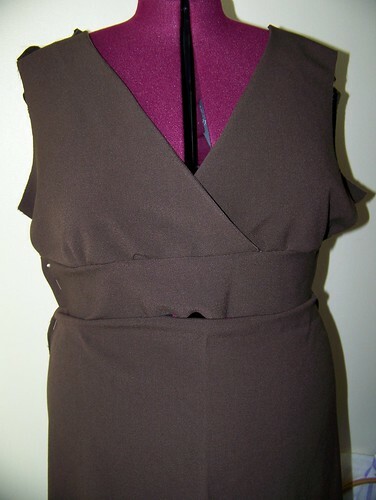 I used a brown crepe-like material to make this dress. 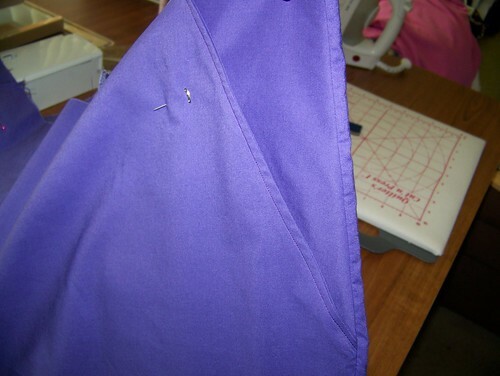 The first picture shows my dress in it’s parts with me adding a sashing to add length and a better drape. This stayed on the form for a month. Well, now there are sleeves added on and after three attempts I finally have the sashing in place and love the end result. Okay do you see what I see. the side seam is showing I will be taking care of this tonight. Overall as I have stated before this is one of my favorite patterns and I like the way I look in this style. 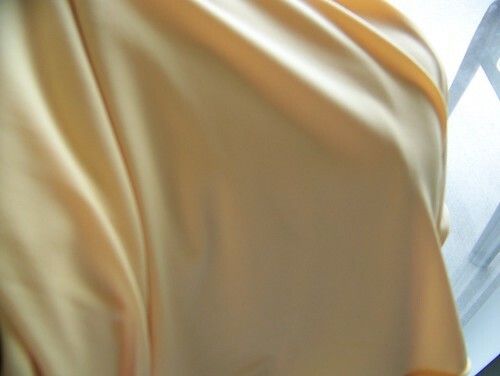 The next photo shows my dress after it was completed. Love it…..love it…..love it. I had considered beading the sashing to add interest but realized that if I do that then my accent choices would become very limited. I did go to JoAnn’s this afternoon as they were having a big sale and I got to use my 40% off coupon and then the 10% off your entire purchase including sales items. Needless to say I did really good. Some advise if you shop at JoAnn’s frequently make sure to pick up the Fall JoAnn’s magazine and take advantage of the coupons on the back cover. 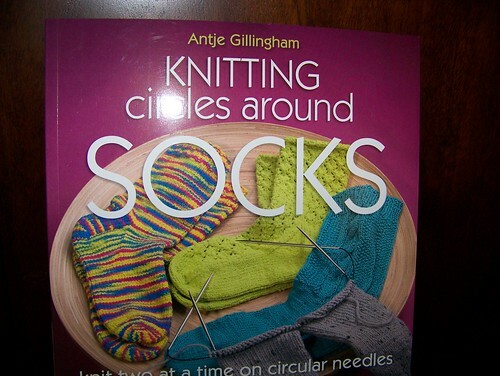 I had mentioned that I was reading the Knitting Circle by Ann Hood and it was slow going at first as I was just so busy with all the things of the last month with school, externing, my girls, and looking for a job that reading for pleasure wasn’t on the agenda. Well, this weekend I decided to complete this book and it was really good. I laughed, cried, and laughed some more. I really enjoyed the characters but the sadness that is real life was a bit overwhelming. 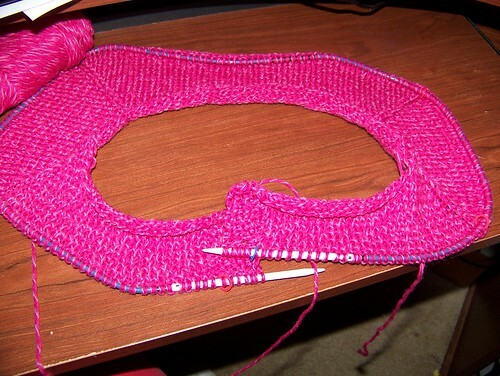 It did one important thing for me and that was to show how you can come together through knitting. On the creative front I’m still working on getting my hats done for Obama’s Homeless Veterans charity. I will be sharing my latest sewing projects, something new that I really want to cultivate and share with all of you by next year. Take care and thanks for stopping by. Here’s my day late FOF installment. 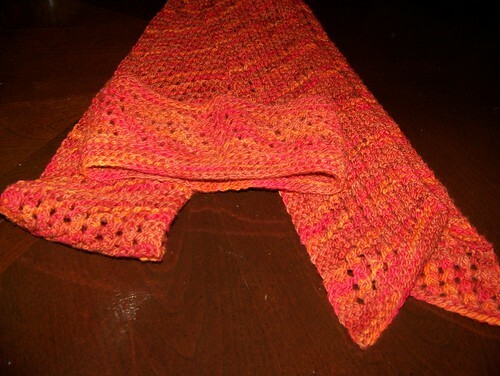 I have finally finished the diagonal scarf and headband knitted up from Scheafer’s Yarn this pattern comes from Scarves a Knitter’s Dozen. 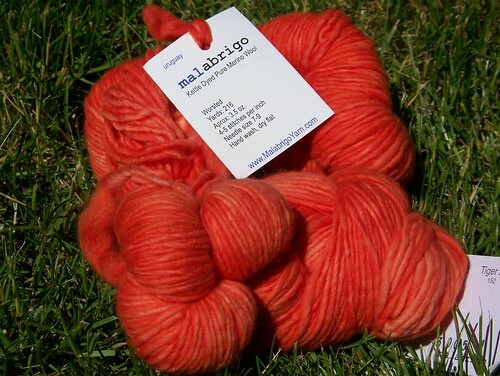 Since this is my first time using hand-dyed yarn of this quality I wasn’t prepared for changing my needles and having orange hands during my knitting process. 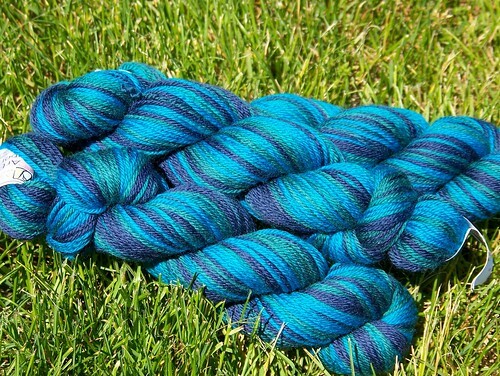 After washing and blocking these I do really like these and the color variation. 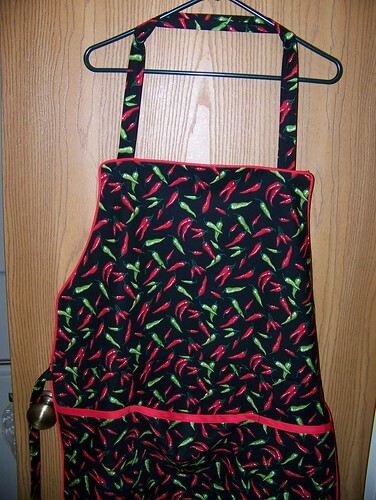 Here’s my Apron made for a friend. 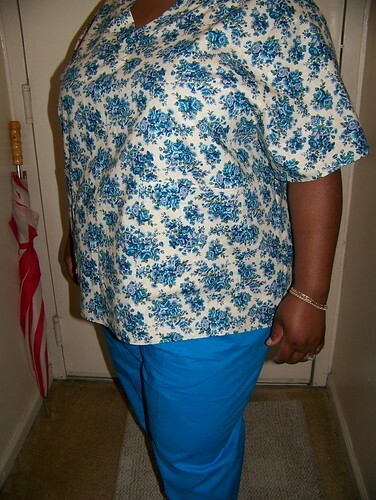 I used novelty fabric that I found at JoAnn’s and added red pipping and bias binding as accents. 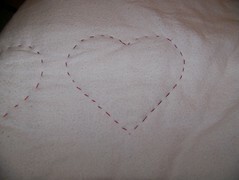 I didn’t use a pattern I drafted this as I went along. I included three pockets and made it double sided. 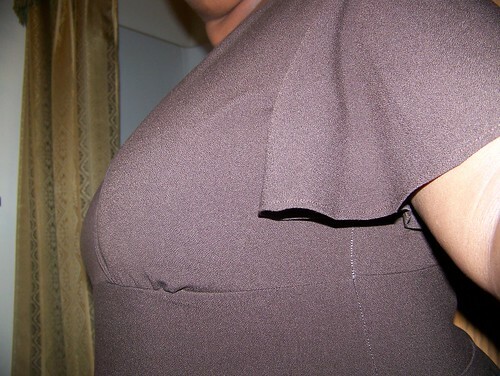 I also made this dress using Simplicity 4877 and using my Knit Jersey fabric from Gorgeous Things and added black piping on the neckline for a more polished look and I was making this dress in a day to wear to a funeral so time was of the essence. 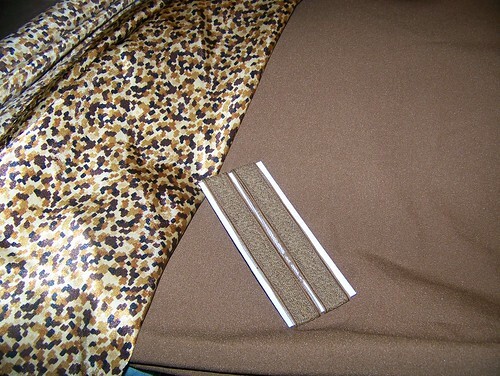 This is the same pattern I used for my brown and pink dress I made a month ago. I really like this particular style on me so you may be seeing this over and over with different little changes along the way. 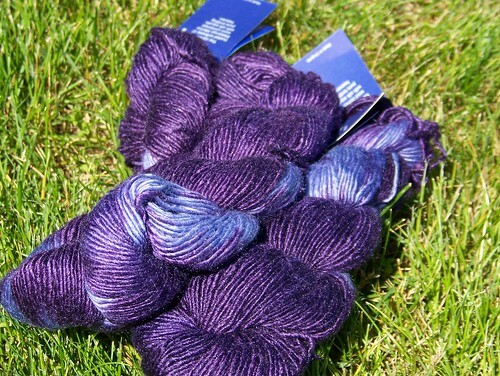 I also got Artyarns Super Merino the colorway is really nice and I’m thinking some socks with this would be really nice. This was my first order from Eatsleepknit it was a very good experience with them and I love the little goodies they sent with my order. I won $5.00 off my next order and they sent a little card you carry in your wallet with the sizes of needles you already own and a little purple ruler for doing gauge swatches. Check them out as the pricing and quick service are worth the trip over to their site. 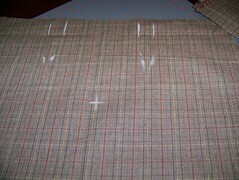 On the left is a Tailors ham and on the right is a Seam Roll. Both are used to aid in setting seams, press curves and open seams properly without compromising the integrity of the garment. 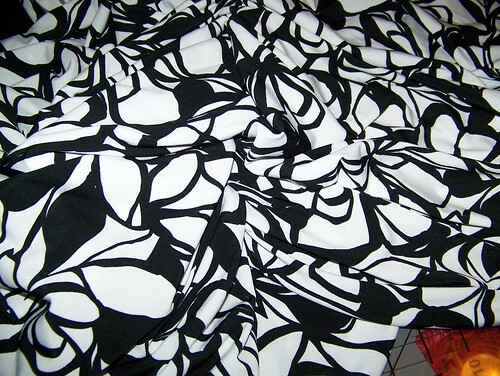 I am loving these fabrics and the drape just seems like it will hang so nicely. 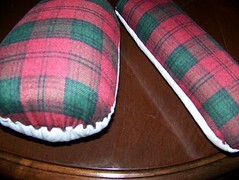 Now let me say this I WILL NOT be doing anything with these until my dressform arrives. Now onto a project that has been a year in the making yes a whole year. I blogged about this project last month I think and it has been through many changes but I finally put the binding on my Girlfriends quilt that I have decided to name the Heart of the Matter. 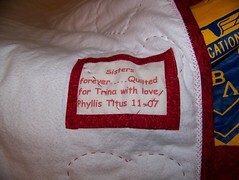 I chose this name because she’s a Delta, I quilted hearts and even found a tshirt I had that talked about friends and was in the shape of a heart so I thought that name really fit the quilt. I hope she likes the outcome. Here’s just a few finally snippets of the project. This is all I have for this week and I think you’ll agree I’ve covered all of my hobbies except crocheting and I’ll touch on that next week. Yes, I’m announcing the impending arrival of some goodies for me. I have been trying for about 6 months to construct a sturdy dressform for myself because it’s too complicated for me to try and fit myself. So I did a lot of online searching and emailed a few of you and asked about your forms and after much consideration of my needs and future desires in sewing went to JoAnn’s and ordered my dress form and got 50% off so with S&H I got a My Body Double Deluxe for less than $130.00 and for plus size that’s a great deal. I also took the time to finally venture over to Gorgeous Things and I really like a lot of what I saw but want to wait until I’m a bit more comfortable with sewing for myself before I just go hog wild there. 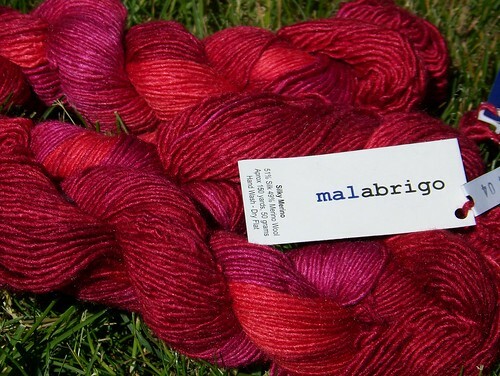 I also ventured over to EatSleepKnit and found me some MMMMMalabrigo yarns in worsted and silk. 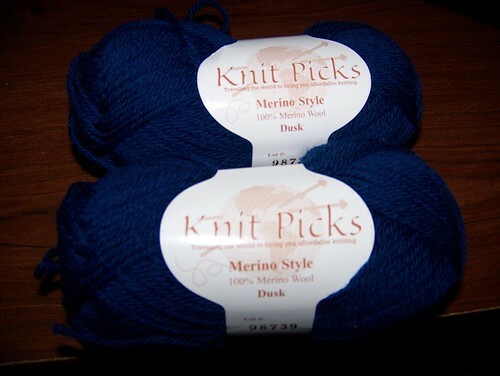 I’ve heard so much about this yarn on other blogs, podcasts and of course, on Ravelry so I’m really looking forward to this experience. I do love the colors and will definitely be ordering more. Well that’s my teaser for the time being and I hope that you’ll stay tuned in the next week or two as my Goodies arrive to see what they all become. I was driving down the street the other day in the midst of all the running and things that make up my daily routine and longed to be sitting somewhere quite with the wind blowing softly, with my Ipod going, and one of my knitting projects making progress. mix in 3 1/2 to 4 cups of sifted flour add 1 tsp. of salt and mix until it becomes firm. Place in a bowl that has been greased with Extra Virgin Olive Oil. Cover with Saran Wrap and place in a warm dry place for at least 45 mins. 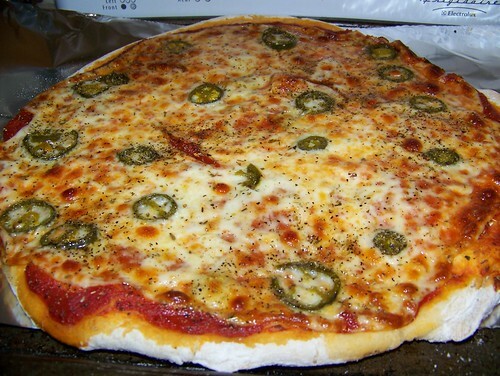 to allow the dough to rise. 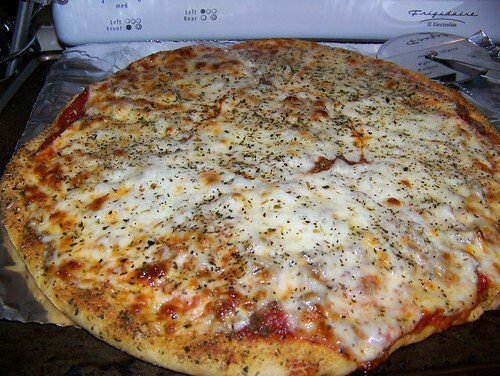 Then prepare your pizza dough by rolling it out using flour to keep it from being sticky. This should make enough dough for three medium pizzas.